It’s said that what we focus our attention on grows. While walking in late January, I noticed a fire hydrant whose cracked red paint revealed white, brown and gold layers, like a collage. I snapped a photo of this unexpected artwork. Suddenly, I noticed hydrants everywhere. My fascination followed me in subsequent trips to the Bay Area and Asheville, NC. I kept taking pictures. Recently, I hopped on my bicycle on a sunny Saturday to follow the impulse to hydrant hunt. While cycling, I wondered: was I on a whimsical quest or onto something deeper? Here is what my unplanned adventure had to teach. Fire hydrants are practically everywhere, distributed at fairly even intervals especially in urban and suburban environments. That I hadn’t noticed them until now gave me pause. How could I have failed to appreciate something that is nearly ubiquitous? Had their very ordinariness caused me to dismiss them in favor of more exotic items? When I’m lost in thought, preoccupied with a problem, or fantasizing about the future, it’s easy to spend stretches of time oblivious to my surroundings in the here and now. 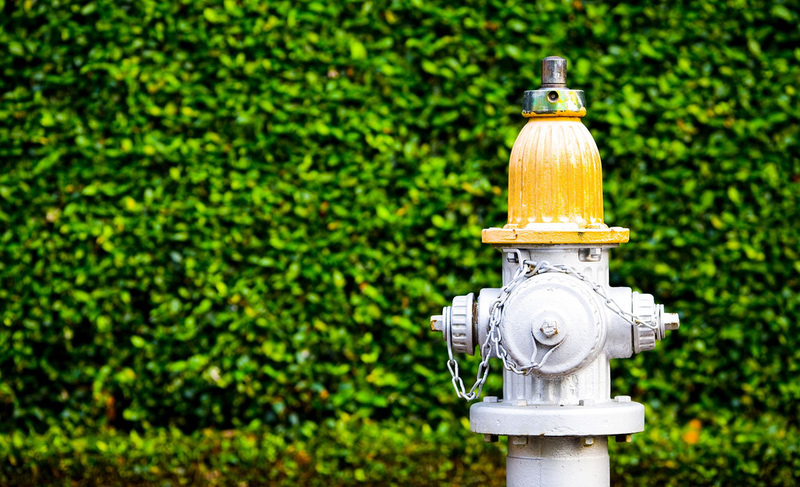 Orienting to hydrants (or anything else) and hooking our attention on them, even for a second, is a way to enter the here and now, where life is actually happening. While elaborate rituals and ritual objects can be important, we don’t always need them to connect with the present moment. In the Boston area, I cycled by a hydrant that came up to my chest. Weathered yet svelte, it recalled an aging starlet. Still others squatted, like lumpy toads, close to the ground. The majority had chipped surfaces, exposing different colors like hard won badges. On one stretch of road several wore placards that said “Out of Service”, perhaps proclaiming that their duty was done or that they needed a rest. Had I stuck to an old template, I wouldn’t have discovered such diversity. Riding around on my bicycle, with my mind free to wander, I wondered why fire hydrants had appeared on my radar. Might they symbolize something? With their solid torsos, stubby arms and mostly round heads, I chose to see them as silent servants of public safety. They are typically ignored by or invisible to most people, subject to harsh weather and frequently marked by canines. Hydrants put up with a lot of abuse yet receive little acclaim. Most of us probably only notice them when they are leaking or broken. That attitude, in our fast paced and transactional culture, can often translate into taking for granted people who toil without fanfare, only becoming aware of them when something goes awry, such as when disputing an unexpected charge or bill. While I once was far more impatient, valuing efficiency above all, perhaps I still needed the reminder that if I can pause to compose a photograph, I can also slow down to acknowledge another person’s effort, even if they are telling me something I don’t wish to hear. Our culture holds up standards for how men and women are supposed to look and dress at various life stages, yet the world would be extremely dull if we all aspired to the ideal. Moreover, it would be terrifying if we resembled clones. The hydrants’ diverse “looks”, including extra crusty and rusty, flaked and scaly, mottled and spotted, didn’t mean they had less to contribute than the red ones, as shiny as freshly manicured nails. Their presence is what is important, as is ours, even though the fear of not fitting in or of being judged for one’s appearance can be powerful, often deterring people from showing up fully or showing up at all. We belong, no matter what we look like. During my hydrant quest, self-consciousness crept in as I cycled around. I wondered if I should stop, turn around and do something more “grown up”, as if spending an hour being delighted had little value. As I keep learning, play for its own sake is a necessity, not a luxury or something we’re meant to outgrow. The need to play comes from our essence and is an integral part of being human. As youngsters, we originally learned about the world through play. That hasn’t left us. When a wave of joy emerges, I have to remind myself that it’s healthier to surf it than either suppress or dismiss it. As vulnerability researcher Brene Brown has discovered, expressing joy is terrifying for many, as joy strips us of our adult masks, leaving us exposed. Perhaps that is why my Zen teacher continually encourages students to “Do what lights you up”, even, or perhaps especially, if what fascinates can’t be easily explained, borders on the bizarre or can’t be monetized. While grand plans can motivate us, having or cultivating the capacity to receive even the humblest of inspirations, to nurture sparks of creativity and to remain playful at any age is priceless and can keep us going when our path is obscured. Even if we’re on track for a big plan, we might achieve our goals in better spirits and with less stress if we can back off from relentless productivity and allow whimsy into the picture. When I noticed that someone had placed pennies atop the bolts a hydrant near a Trader Joe’s, I grinned; I was not alone. If we are only willing to work towards big, serious or lucrative outcomes, or if we seek approval or adulation instead of digging deep for our own wellspring of joy, we might find ourselves creatively and spiritually impoverished. Then, like those hydrants with the “Out of Service” labels, we won’t be contributing to the world.